Few companies have a rivalry as fierce and longstanding as PepsiCo and Coca-Cola and in their never ending battle for soda market dominance each company has gone to some spectacular lengths to screw over the other. Arguably the most fiendishly genius move of all was one made by Coca-Cola in the early 1990s- a move that basically involved intentionally releasing a terrible product purely to try to screw over by association a similar product released by Pepsi. The genesis for this tale began in the early 1990s during what is referred to in the marketing world as the “Clear Craze”. In a nutshell, for whatever reason, many companies began releasing clear versions of their products, using marketing buzzwords like “pure” and “clean” to advertise them to the public. A company recognised as the industry leader in this regard was the soap giant, Ivory, who, among other things, released a clear version of their dish soap in the early 1990s. Ivory Clear was advertised with rather questionably accurate slogans like “Ivory attacks the grease, not the natural oils in your skin”. The idea of clear products was quickly used in diverse and eclectic range of products including Zima Clearmalt (a clear citrus beer), Mennen Crystal Clean deodorant, and, perhaps most bizarre of all, Amoco Crystal Clear gasoline. As you might have guessed given the lack of ubiquitous see-through products on your local super market shelves, most of these products either failed miserably or quietly faded into obscurity when the Clear Craze went full meta and disappeared. This brings us to Crystal Pepsi, which was devised by then COO of PepsiCo, David Novak, in 1992. The soda was virtually identical in composition to their flagship product, sans the caramel coloring used to give so many sodas their distinctive brown hue. Novak’s idea was to market the soda like other products released during the Clear Craze and hope consumers would equate it being clear with “purity” and, thus, assume that it was a healthier alternative to regular Pepsi. Of course, as sodas are wont to be, Crystal Pepsi was still terrible for you. For example, a single 20 oz bottle of Crystal Pepsi still contained around 69 grams of sugar, or about 16 teaspoons worth- the same as normal Pepsi. Taste wise, Crystal Pepsi is extremely similar to regular Pepsi, however, fans of the product claimed they could still tell the difference, though how much of this was just in their heads isn’t clear. Novak decided to ignore these concerns, and presumably also ignored the fact that by saying Crystal Pepsi was better because it wasn’t brown they were literally advertising that all their brown drinks weren’t good for you. Despite all this, Crystal Pepsi was rushed into production. Initially it seemed that Novak’s gut feeling was correct and trials in cities like Denver and Dallas in early 1992 garnered positive feedback from customers. Encouraged by this, PepsiCo eventually rolling out the product nationwide in early 1993. In their initial advertising blitz for Crystal Pepsi, Pepsi paid millions for a minute long Super Bowl ad to celebrate it’s launch. The ad, which can be viewed here in all its glory touts Crystal Pepsi as the drink for “Right now” and is full of pseudo-intellectual quotes like, “Right now nature’s inventing better stuff than science” and “Right now only wildlife needs preservatives”. Also, because subtlety apparently died in the early 90’s, the entire ad is set in time to the Van Halen song, ‘Right Now’. They followed this up by spending a total of around $40 million, about $70 million in today’s dollars, pushing the product in broader advertising. As to why the product flopped so spectacularly, this seems to all center around basic human psychology. To begin with, it was noted that because the only other mainstream sodas out there that were clear were citrus based, like 7-Up and Sprite, many consumers initially thought Crystal Pepsi must be the same type of drink. When they noted it tasted almost exactly like Pepsi, most simply went back to drinking the original brown version of the product. In essence here, Pepsi were going against a literal century old association that cola should be brown. This is a real problem, as noted by marketing professor Kyle Murray at the University of Alberta. In his study, The Role of Arousal in Congruity-Based Product Evaluation, it was demonstrated that when people are presented with products that are otherwise exactly as expected except just changing one very apparent thing, like the color, they actually show genuine physiological signs of anxiety. Thus, things like a drink that tastes exactly as people expect a brown cola to taste, but is clear, literally makes people’s pulses rise and increases perspiration. 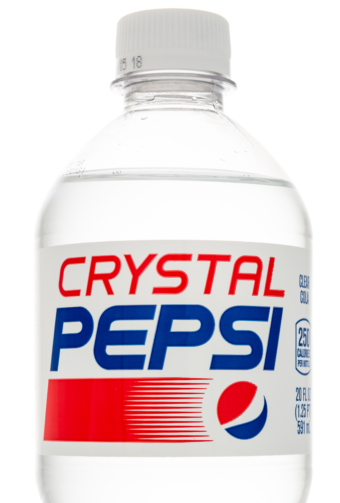 Nevertheless, as noted, thanks to a rather massive marketing push, while Crystal Pepsi was falling short of Pepsi’s hope that it would be a billion dollar brand (needing to capture at least 2% of the market to achieve that figure in 1990s dollars) it was still doing reasonably well out of the gate. Enter a little more psychology and PepsiCo’s chief rival, Coca-Cola. Thanks to the successful launch of Diet Coke, Coca-Cola had a diet drink on their hands that had more or less faded into obscurity- Tab. This negative association with diet drinks among half the population and a brand that Coca-Cola didn’t really care about got the wheels turning among executives at Coca-Cola, with the result being a rather ingenious idea to hurt sales of the upstart, Crystal Pepsi. Launched as a direct competitor to Crystal Pepsi in December of 1993, Tab Clear was later described by former Pepsi executive and, at the time, head of marketing for Coca-Cola Sergio Zyman as a product the company intentionally sent to die, almost purely to spite Pepsi. In a nutshell, this was just the exact same drink as Tab, sans caramel coloring. The company also removed the caffeine from the product- another move that isn’t terribly popular with consumers. They then very prominently featured the fact that the product was caffeine and sugar free right on the can. Naturally, both being clear colas, most stores stocked Crystal Pepsi and Tab Clear very close to one another. This all combined had Coca-Cola’s executives hoping consumers would similarly assume that Crystal Pepsi was a diet drink and caffeine free. If accepted by the public, these two factors would virtually guarantee that Crystal Pepsi would never be a mainstream drink, no matter how hard Pepsi tried to make it a thing. Within three or five months, Tab Clear was dead. And so was Crystal Pepsi. Zima, the clear alternative to beer, was made via filtering otherwise normally brewed beer through charcoal and then adding some citrus flavoring. Unfortunately for Coors, makers of Zima, consumers very quickly began to see this drink as effeminate, with it achieving only a niche market, particularly popular among college aged women. To get around this, Coors launched a series of ads featuring men doing manly things while drinking Zima, but it didn’t work. Otherwise beer guzzling men treated Zima like a product that was made almost purely of estrogen. Later, they managed to salvage the product slightly by pushing it as, essentially, an alcoholic version of sprite or 7-up, but it was still only a niche product. You forgot to mention that Pepsi rebranded Crystal Pepsi as Crystal with New Citrus Taste before it officially died. That is such a power move, I am impressed. That’s all well and good. however, it’s back. I can buy crystal Pepsi at my local supermarket and a gas station here.